The present study, published in the Revista de Administração da USP (RAUSP -vol. 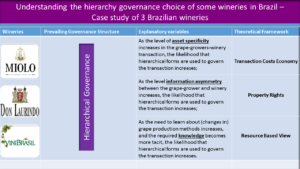 51, no.1 ), presents an analysis from several different theoretical perspectives of the choice made by the wineries for adopting a hierarchical governance structure. Most studies examine governance structure choices from a single theoretical perspective. We — members of the Center for Organization Studies, CORS, USP — have taken a different approach in the present study, based on the belief that a single theory is unable to satisfactorily explain these choices. Specifically, the objective of the present study is to contribute to the understanding of the multiple factors that influence a company’s choice of governance structure, using Transaction Cost Economics (TCE), the Resource Based View (RBV) of the firm, and Property Rights Theory (PRT). To identify some of these factors, three Brazilian wineries were analyzed: the Miolo winery, located in the Valley of the Vineyards (southern Brazil) and in the Valley of the São Francisco River (northeastern Brazil); Don Laurindo, a winery located in the Valley of the Vineyards; and ViniBrasil, a winery located in the Valley of the São Francisco River. The three wineries studied opted for a hierarchical governance form, producing their own grapes for their wine production. Only Miolo procures some grapes from external grape producers, although this is a small amount compared to its internal grape production. It is important to note that grape production, mainly in the southern region of the country, has a long tradition and it is not difficult to purchase a sufficient amount of grapes for wine production. The study identified that the quality of the grapes is easy to measure, and the purchase price of grapes in the market is below their production cost. Nevertheless, wineries produce their own grapes to ensure the quality of the grapes and hence of the wine produced. 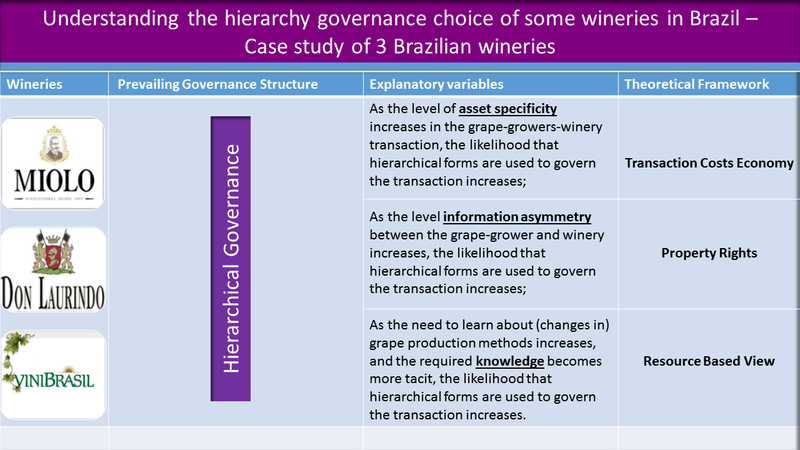 The level of asset specificity present in the transaction between winery and grape grower seemed, by itself, insufficient to explain the reliance of the companies on the hierarchical governance form. Therefore, TCE, on a stand-alone basis, could not fully explain the governance choices of the wineries; thus insights from the other two theoretical frameworks were required. In the case of Miolo, TCE helps to explain why the company has internalized most of its grape production yet purchases some of its grapes from a small group of select producers since this reduces transaction costs resulting from demand uncertainty as well as transaction costs resulting from temporal and site specific related transaction hazards. RBV offers a complementary explanation for Miolo’s choice of governance structure, since the company has extensive experience in producing grapes and wines through the tacit knowledge it has acquired. In terms of PRT, the option for hierarchical governance occurs because of the residual control rights of the grape and wine production. Moreover, due to the difficulty of transacting the residual control, informal contract with suppliers prevails. In the case of Don Laurindo, TCE was used to identify an important benefit of the company’s decision to vertically integrate in the first place: it helped the company reduce transaction costs resulting from demand uncertainty and temporal asset specificity related transaction hazards during a crisis in the Brazilian wine industry. RBV offers an explanation for why the company has remained vertically integrated since: it has developed tacit knowledge about producing the grapes in a manner that is most suitable for the production of its own fine wines. By remaining vertically integrated, it does not need to incur effort and difficulty in communicating or transferring its knowledge to external producers. From the perspective of PRT, Don Laurindo prefers to retain the control rights of grape production process, as it then can make changes to the production process how and when it so desires. The ViniBrasil Winery is also vertically integrated. Vini Brasil is located in the Valley of the São Francisco River, a region with a climate and production characteristics different to those of southern Brazil, a traditional winery location. In terms of TCE, vertical integration helps reduce transaction costs resulting from demand uncertainty and site-specific investments. RBV also helps explain the company’s decision to vertically integrate, since it made investments in innovation for producing grapes adapted to that particular climate. Over time, the company developed the know-how required to produce grapes in that region. In terms of PRT, the company wants to ensure that all investment made over time in innovation remain within the boundaries of the company and that residual control rights are not shared with external actors. We have attempted to use various theoretical perspectives to explain different aspects of the studied phenomenon. Our study suggests that future research into this complex interaction among the three different theories is essential for explaining the use of the hierarchical governance structure.